When you are thinking about renting or buying a home in Chippewa Falls, there is so much to think about. What are the schools like, what is the crime rate, what is the potential resale value? However, you probably don’t think about what the probability of a flood occurring. This should be something you consider while you buy, however, because flooding and water damage can happen even if you are very responsible and don’t let your pipes freeze. Here are some ways to prepare yourself if you are in a flooding zone and have the potential need for water damage restoration from companies like TRAC Solutions in the future. Are You in a Flood Plain? The first thing you need to find out when you initially move in is if you are in a floodplain. Floodplains are everywhere, not just coastal areas, and it is very easy to find out if your home is in an at-risk area. You just need to go to the government website, fema.gov to look up your address in the database. It will tell you the annual chance of flooding in your area and surrounding areas. 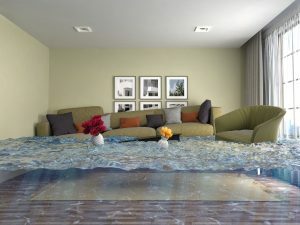 After you find out what area you live in, you might want to consider buying additional flood insurance for your home. Even if you rent, this can be a good idea to protect your valuables, even if you don’t have to worry about the repairs for the home itself. Flood insurance is relatively cheap and can save you a lot of money in the long run, depending on the insurance company that you have. You should take time to shop around for a good deal. Before a flood even happens, it can be beneficial to put a company’s contact information on your phone. If you experience a bad flood, you may not be able to have your electricity or other utilities running and it will be convenient to you to have the information of a local water damage restoration professional in your phone. It is always a good idea to have emergency contact information in your phone, and you will be even more prepared having companies to help you out in a crisis in there as well. Most families have an emergency plan for if their house was on fire, but not a lot of people prepare for and discuss floods with their children. Floods may not always be as fast acting as a fire, but they can be very devastating. Especially if you are in a floodplain, you should have a plan set for the residents of your home. Have access to the roof and show your family members how to get up there. If you are caught in a serious flood, the roof might be the safest place. Show your family members how to shut off the utilities and discuss the danger of electricity when it comes in contact with water. Have a meeting place in case not everyone is home when the flooding takes place or you are separated for any reason. It might also be helpful to have emergency food rations in case there is any kind of emergency.